PLANNED AS PART OF THE OUTER BELTWAY: In 1950, officials in Maryland devised plans for a "Cross-County Loop," a controlled-access highway that was to link US 240 (now I-270) in Montgomery County with the Baltimore-Washington Parkway (MD 295) in Prince George's County. It was the direct predecessor to today's Intercounty Connector and a springboard for a more ambitious highway proposal. As plans were being accelerated for the original Capital Beltway (I-495 and I-95), the National Capital Park and Planning Commission announced in 1953 a preliminary 120-mile second beltway that was to loop through the outer suburbs of Maryland and Virginia. The Outer Beltway--as it was called then--was to enter Maryland from a new Potomac River crossing at Great Falls and continue east through the Montgomery County communities of Potomac, Rockville, and Silver Spring; then loop southeast into Prince George's County through Beltsville, Laurel, and Bowie; and back southwest through Upper Marlboro, Clinton, and Fort Washington before crossing the Potomac River again on a new bridge to Virginia. Unlike the Capital Beltway, the Outer Beltway was not part of the Interstate highway system and thus was ineligible for 90 percent Federal financing. This meant Maryland and Virginia had to pay half the cost of the Outer Beltway. Plans for the Outer Beltway were stalled as Maryland and Virginia officials sought to accelerate completion of the Capital Beltway and other higher-priority Interstate highway projects. Once the Capital Beltway was opened to traffic in 1964, officials shifted their attention back to the Outer Beltway. Around this time, citizen groups became more active in opposing highway projects; they had prevented construction of the Northwest Freeway--what would have been an extension of I-270 into the District--along the Wisconsin Avenue corridor. In 1965, local groups petitioned the Maryland State Roads Commission (SRC) to move the route of the beltway north about five miles such that the Potomac River crossing would be at Block House Point instead of Great Falls. Jerome Wolff, chairman of the SRC, said the state took "a dim view" of changing route plans once they are settled, but Walter Addison, the head of the SRC's planning division, acknowledged the benefits of changing this alignment since the narrowest point between the Capital and Outer beltways (in Rockville) were only two and one-half miles apart, not enough to provide ample freeway spacing. Even with the route of the Outer Beltway in flux, the SRC spent $3 million on rights-of-way along the original alignment throughout the 1960's, and even spent $500,000 to build a six-lane bridge to carry Connecticut Avenue (MD 185) over the proposed beltway in Silver Spring in 1968. An assistant engineer for the SRC said "some road" would go under Connecticut Avenue even if it were not the Outer Beltway. Community groups finally succeeded in 1970 with the SRC's decision to shift the Outer Beltway to a more northerly alignment between Gaithersburg and Silver Spring; the beltway would continue on its original alignment east of Silver Spring. With the Outer Beltway planned to handle through traffic, the SRC planned a second east-west freeway--the 10-mile-long "Rockville Facility" (originally called the "Rockville Freeway")--for local traffic that was to connect Falls Road (MD 189) just west of I-270 with the Outer Beltway near New Hampshire Avenue (MD 650). In the early 1970s, environmentalists blocked successfully any provision for a Potomac River crossing for the Outer Beltway north of the American Legion Bridge (I-495). 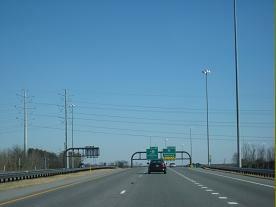 With the northerly Potomac crossing blocked, it did not take long for Virginia officials to downscale plans for their sections of the Outer Beltway, though it was built in sections in the 1980s and 1990s as the Fairfax County Parkway (VA 7100), a partially controlled access arterial highway. Meanwhile, studies in Maryland found traffic was insufficient to build a Potomac crossing between southern Prince George's County and southern Fairfax County in Virginia. Although the Outer Beltway lingered in long-range county and regional plans, it was removed as a line item in budgets beginning in 1974 due to a deep recession, lower gas tax revenues generated from the 1973-1974 oil shock, and increased environmental concerns. By 1977, the Outer Beltway was all but dead; Maryland officials killed the beltway officially in 1980. FROM THE ASHES OF THE OUTER BELTWAY: One section of the Outer Beltway--the section from I-270 in Gaithersburg east to the Baltimore-Washington Parkway (MD 295) in Beltsville--survived the planners' axes and in 1975, the Metropolitan Washington Council of Governments supported the Maryland State Highway Administration's (SHA) planning and engineering study for the route. The route, which was first called the "Intercounty Connector" (ICC) in 1977, was to provide a direct east-west link between I-270, I-95, and BWI Airport while removing traffic on congested local roads. Plans for the Intercounty Connector, whose cost originally was estimated at $221 million, actually had preceded those for the Outer Beltway by three years. Almost immediately, the truncated route stoked controversy. Environmentalists feared the then-planned eastern terminus of the Intercounty Connector at the Baltimore-Washington Parkway would encroach on the Patuxtent Research Refuge, a large plot operated by the US Fish and Wildlife Service. In acknowledgement of these concerns, the National Capital Planning Commission (NCPC) recommended to the SHA in 1983 that the connector be shortened from MD 295 four miles west to I-95 to avoid damage to the reserve. 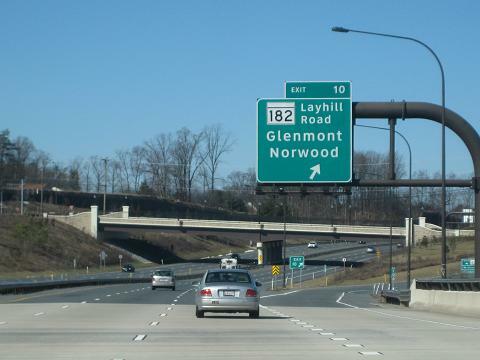 Other critics such as then-Montgomery County Executive Charles Gilchrist said construction of the Intercounty Connector was "infeasible" at least prior to 2000. Gilchrist suggested widening local roads such as MD 28, MD 182, MD 650, and MD 198 between Rockville and Burtonsville to minimize community and environmental impact. The $83 million price tag for this alternative was about one-third the cost of the proposed ICC. The most ardent environmentalists opposed any road construction and favored transit use in this corridor, while pro-ICC forces--including one official at the NCPC--derided Gilchrist's alternative as "penny-wise and pound-foolish." 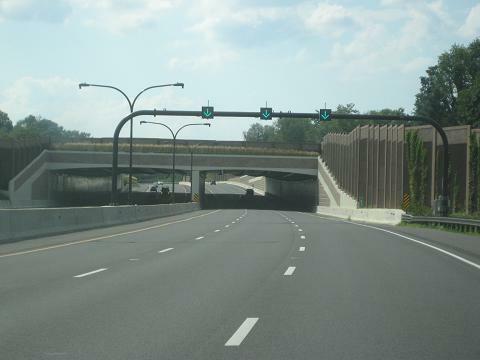 Through much of the 1980's, the Intercounty Connector was considered a project to be built in conjunction with the Rockville Facility; the local press often referred to the combined project as "ICC / RF." Hopes for building the Rockville Facility were dashed in 1989 when the SHA turned over 102 acres of right-of-way over to the state's Department of Natural Resources, which designated the land as Matthew Henson State Park. I-370 AND THE ICC: One early success along the Outer Beltway / ICC route was the development of I-370, which was conceived as a 2.5-mile-long connecting route between I-270 and the then-proposed Metro-Red Line extension to Shady Grove. The Shady Grove extension was approved in 1975, and two years later, I-370 was approved with Interstate highway transfer funds--mostly from unbuilt Baltimore highways--as a controlled-access link between the station and I-270 to be built in the Outer Beltway right-of-way. Work on the I-370 connector did not begin until 1984; the SHA opened the $169 million connector to traffic on December 22, 1988. THE ICC VERSUS GLENDENING AND "SMART GROWTH": Throughout the 1990s, proponents of the ICC appeared to lose momentum as the tenets of "smart growth" grounded in densely populated communities connected by mass transit came into vogue. In 1992, the U.S. Environmental Protection Agency (EPA) began studies on the proposed route that culminated in a draft environmental impact statement five years later. However, stopping the ICC ultimately proved difficult. As the state already owned much of the land, pro-ICC proponents would have been able to stop such a sale at the Maryland Board of Public Works (BPW), which must approve excess right-of-way transactions back into public hands. The Montgomery County Planning Board said removing the ICC from their master plan would take six or seven years. The ICC favored heavily in the 1998 election, and as "smart growth" initiatives gained traction that year across the country, Glendening--the Democratic candidate coasted to victory over GOP challenger Ellen Sauerbrey. Nevertheless, Glendening convened a panel called the Transportation Solutions Group (TSG) to study the proposed route, and in February 1999 the panel voted eight to four in favor of building a four-lane toll road (with two lanes in each direction) along the route of the ICC. The favored plan represents a compromise between those who oppose any new road and a full-fledged freeway sized to cater fully to projected (unpriced) demand. It will be a pioneering project because the panel is fully persuaded that only by using pricing in a creative way will it be possible to finance the road and also to contain demand to the dimensions of a road that we believe will have minimal environmental impact. The TSG's rendition of the ICC called for a four-lane tollway with variable pricing and free or discounted use for carpools (i.e., high occupancy toll or HOT lanes). Pricing would range from 13 cents per mile in off-peak periods to 17 cents per mile in off-peak periods; it was assumed most ICC travelers would travel short distances and not the entire length. The width of the proposed TSG alternative was to be only 80 feet and the right-of-way only 164 feet, approximately half the right-of-way required by the state's official proposal. Nevertheless, Glendening rejected the TSG's findings on the grounds that it was incompatible with "smart growth" initiatives. EHRLICH MOVES THE ICC TO THE FAST TRACK: By 2002, however, the focus had shifted to stimulating growth, creating jobs, and relieving congestion, and Republican gubernatorial candidate Robert Ehrlich, who campaigned on an anti-congestion platform, won the election that year. The 2002 election also ushered in a slate of new members on the Montgomery County Council who like Ehrlich favored construction of the ICC. As the official consensus began to sway in favor of the ICC, the National Capital Regional Transportation Planning Board (TPB) voted in 2004 to include the highway in its regional transportation plan, determining the ICC met air quality goals and that funding could be obtained through tolls. On July 11, 2005, Governor Ehrlich announced plans to build the ICC along Corridor 1, most of which ran along right-of-way purchased already by the state for the long-dormant Outer Beltway. This plan would require the condemnation of 57 homes on land not purchased already for the route. The northerly alternative, now called Corridor 2, would have had a reduced environmental impact, but would have required the condemnation of 83 homes and more significant outlays for land purchases. It also would have encroached on the Rocky Gorge Reservoir--which is an important water supply for the Washington area--and doing so effectively would have jettisoned the project altogether. Ehrlich appealed to President George W. Bush to move the ICC to the fast rack; its approval as a high-priority project meant would Federal resources would be directed and the approval process would be streamlined for the ICC. The BPW approved the selection of Corridor 1 on August 31, 2005, and the Federal Highway Administration (FHWA) followed suit on May 30, 2006, stating that Maryland had satisfied "all environmental, economic, and community requirements" in order to build the ICC. SECTION BY SECTION, THE ICC TAKES SHAPE: Ehrlich broke ground for the ICC on October 25, 2006, but even as he lost the governorship to Democratic party challenger Martin O'Malley less than two weeks later, O'Malley pledged to continue work on the ICC. Work on the first of the construction contracts began on November 13, 2007. CONTRACT A: Begun on November 13, 2007 and completed on February 23, 2011, Contract A extended from the western limit of the ICC project at Exit 2 (MD 355 / Frederick Road) interchange east to Exit 8 (MD 97 / Georgia Avenue). This 7.2-mile-long, $479 million Contract A was built with a design capacity of approximately 100,000 vehicles per day (AADT). MD 355 (Frederick Road) in Gaithersburg: Exit 2 was rebuilt as a modified directional-T interchange with single roadway leading to MD 355. The eastbound slip ramp to Shady Grove Road was eliminated. Spur to Metro-Shady Grove in Gaithersburg: Exit 3 to the Metro-Shady Grove Spur was built as a directional-T interchange, replacing the existing curve from I-370 into the Shady Grove spur. MD 97 (Georgia Avenue) in Rockville: Exit 8 was built as a modified cloverleaf; land was reserved at southwest corner of interchange for future park-and-ride lot. CONTRACT B: Begun on January 16, 2009 and completed on November 22, 2011, Contract B extended from Exit 8 east to Exit 16 (US 29 / Columbia Pike) interchange. The projected cost of this 7.0-mile-long section is $560 million. The 7.0-mile-long, $560 million section was built with a design capacity of approximately 65,000 vehicles per day. MD 182 (Layhill Road) in Aspen Hill: Exit 10 was built as a diamond interchange. US 29 (Columbia Pike) in Silver Spring: Exit 16 was built as a modified three-level "stack" interchange, with one cloverleaf loop for the MD 200 eastbound to US 29 northbound movement (all other movements are on conventional and flyover ramps). CONTRACT C: Begun on April 7, 2008 and completed on November 22, 2011, Contract C extended from Exit 16 east to Exits 19A-B (I-95) in Laurel. The 3.7-mile-long, $514 million section was built with a design capacity of approximately 85,000 vehicles per day. I-95 in Laurel: Exits 19A-B was built as a modified cloverleaf interchange, but with flyover ramps from eastbound MD 200 to the I-95 northbound C/D road and from the southbound I-95 collector-distributor (C/D) road to eastbound MD 200. This part of the project included the extension of the I-95 C/D roads from the Exit 31 (MD 200 / Intercounty Connector) south to Exit 29 (MD 212) in Beltsville. CONTRACT E: Begun in the fall of 2009 and completed on November 7, 2014, Contract E extended from Exits 19A-B east to the terminus at US 1. This 0.9-mile-long section was built at a cost of $65 million. Unlike the westerly sections of MD 200, which are to be built with six lanes (three in each direction), this final section of the ICC is to be built with only four lanes; this section has a design capacity of only about 40,000 vehicles per day. US 1 (Baltimore Avenue) in Laurel): This grade-level signaled intersection does not have an exit number. Land was reserved at the northwest corner of this intersection for an MdTA maintenance facility. EXTEND THE ICC EAST TO THE BW PARKWAY: The Intercounty Connector should be extended east of US 1 to the Baltimore-Washington Parkway (MD 295) in the vicinity of MD 197 (Laurel-Bowie Road). The ICC extension would provide a more direct link to Fort Meade and BWI Airport to the north and the NASA-Goddard Space Center to the south. Upon completion, the ICC should receive the I-370 designation, denoting its status as an extension of the existing I-370 near Gaithersburg, as well as a connector between I-270 and I-95. SOURCES: "Parkway Plan Is Stepped Up in Maryland" by Laurence Stern, The Washington Post (1/24/1958); "Buy Now, Officials Urge, For Future Land Routes," The Washington Post (1/29/1958); "New Routes Proposed for Beltway in County," The Washington Post (8/07/1965); "Connecticut Avenue Overpass Started," The Washington Post (7/18/1967); "Outer Belt Shift Given More Study" by Jack Eisen, The Washington Post (10/26/1967); "Planned Maryland Outer Belt Route Will Stand" by Thomas W. Lippman, The Washington Post (1/23/1968); "Segment of Outer Beltway Is Endorsed by COG Board" by Jack Eisen, The Washington Post (2/24/1975); "Citizens, Builders Unhappy With Prince George's Growth Plans" by Sharon Conway, The Washington Post (12/22/1977); Shady Grove Transit Station: Area Sector Plan, The Maryland-National Capital Park and Planning Commission (1977); "Subdivision Backed on Major Road" by Janis Johnson, The Washington Post (7/14/1978); "A $16 Million Road to Nowhere" by Elsa L. Walsh, The Washington Post (12/10/1981); "US Urges Shortening of Maryland Connector Road" by R.H. Melton, The Washington Post (11/07/1983); "Gilchrist Levels Acerbic Attack on Proposed Connector Highway" by R.H. Melton, The Washington Post (12/13/1983); "Intercounty Highway Designated " by R.H. Melton, The Washington Post (6/28/1984); "Contract Awarded To Link Interstates in Montgomery" by John Lancaster, The Washington Post (4/11/1987); "Kramer Urges Making Park of Road Land" by Jo-Ann Armao, The Washington Post (12/13/1988); "Friction Scales Maryland Summit of Cooperation" by Michele L. Norris, The Washington Post (9/12/1991); "Maryland ICC First Dynamically Priced Pike Pushed" by Peter Samuel, Toll Roads News (2/04/1999); "Glendening Kills Intercounty Connector" by Alan Sipress, The Washington Post (9/23/1999); "Ehrlich Team Resumes Study of ICC from Rockville to Laurel" by Stephen Kiehl, The Baltimore Sun (1/28/2003); "UM Report Says Suburban Road Would Help BWI" by Michael Dresser, The Baltimore Sun (9/17/2004); "ICC Praised at Hearing As Way To Relieve Gridlock, Panned As Inciting Sprawl" by Michael Dresser, The Baltimore Sun (1/05/2005); "Proposal Minimizes Homes Razes, But Will Disrupt Environment" by Andrew A. Green, The Baltimore Sun (7/12/2005); "Maryland Highway Expected To Get Green Light" by Steven Ginsberg, The Washington Post (3/23/2006); "Intercounty Connector Gets Final Approval, Work in Maryland Set To Begin in Fall" by Steven Ginsberg and Matthew Mosk, The Washington Post (5/31/2006); Intercounty Connector: Administrative Action Final Environmental Impact and 4(f) Statement, Federal Highway Administration, Maryland Transportation Authority, and Maryland State Highway Administration (2006); "Will ICC Right-of-Way Become Future Parkland?" by Wayne Goldstein, The Montgomery County Sentinel (4/26/2007); "ICC Bond Sale Delayed," The Baltimore Sun (9/12/2008); Scott Kozel; Mike Pruett; Douglas A. Willinger. MD 200 and I-370 shields by Scott Colbert. Back to The Roads of Washington-Baltimore home page.